Take advantage of the most comfortable and flexible seat belt around. Our SAFE-Belt Ergonomic Forklift Seatbelt is extremely comfortable and designed with the user in mind. This belt provides the flexibility and maneuverability you need. The optional ignition isolation switch can be utilized to prevent the forklift from being started until the seatbelt is fastened. 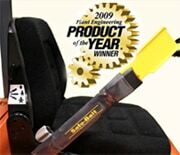 The yellow spring action arm displays when the seatbelt is not in use and the orange color of the belt can be seen from a distance to ensure compliance. The price is comparable to a standard OEM forklift seatbelt but has more features and complies with OSHA regulations.